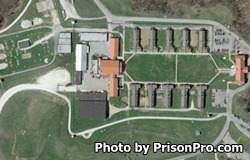 Algoa Correctional Center is located in Jefferson City Missouri. It is a minimum security prison that can house up to 1,500 adult male inmates. This prison has the distinction of being the only male correctional facility in Missouri that has the InnerChange Freedom Initiative program (IFI for short). This is a program offered by the prison fellowship ministries, and starts in the last year or two of an inmates sentence. The IFI program prepares inmates for life after prison by helping the offender to develop spiritual and moral compass, and by creating a system of values within the inmate. While incarcerated at Algoa Correctional Center inmates can also participate in educational opportunities that allow them to earn a GED and adult basic education. The visiting hours for inmates at Algoa Correctional Center in Missouri are Fridays, Saturdays and Sundays from 9:30am-1:30pm and 2:30pm-6:30pm.